Forget super foods - think Mediterranean diet. That's how I see these foods, dishes, and ingredients. They've been in the cupboard, the refrigerator, and on the table my whole life given my family's ethnic roots in Greece. So the spanakorizo (spinach rice) detailed here epitomizes what I think when I hear "super foods." And it's the one dish I've experienced a complete turnaround with. Mom's version was on the dinner table once every two weeks or so for as long as I can remember (the only exception - summertime, since this really is a cold weather dish). I had zero interest in and appreciation for spinach until after college. The color was off-putting, and the consistency of the cooked vegetable made me squirm - I would try to separate the rice from the spinach and just take a few forkfuls of that. The meal took what seemed liked hours to finish. Flavor factored into my judgment not one bit. Nor did the comfort of the warmth of the dish, and the perfection achieved when accompanied by a hearty piece of whole grain bread (preferably warmed) and a bit of feta cheese (hey, I'm Greek!). Yes, that all changed. I can't say when - it just happened. It was always there, it wasn't going anywhere, it grew on me - the flavor did, and the perfection with the accompaniments. And its persistent presence made its way into my brain - I realized I felt good when I ate spanakorizo, I was satisfied. I've done my share of not treating my body well, but this dish continues to counter the effects of that. And it does so without a whole lot of fuss and too much time. While the recipe has evolved over the years - it's crossed generations and continents - the foundation remains the same. A modern day superfood with very traditional roots. Enjoy! A flavorful side dish with Greek roots and lots of spinach. Rinse the spinach and dry it gently. Set aside.Heat the olive oil in a medium pot over medium heat. Add the onions and saute until tender, about 5 minutes. Add the chopped and pureed tomato and saute another 5 minutes. Add the 1/2 cup rice, salt, pepper, stir; let cook for 10 minutes. (Add some of the boiled water, as needed, if it seems to dry for the rice - just a bit, maybe 1/4 cup. )Add in the spinach; mix everything to evenly distribute. Cook for another 20 to 25 minutes. Taste to be sure rice has cooked fully.Serve as main meal with a piece of a nice whole grain bread; or use as a side dish for a main dish (goes great as a side with most any fish). That has me written all over it! Very nice, your dish conjures up great memories. My grandmother was Greek and a rice dish similar to this one was her specialty. She'd serve it typically with roast chicken. She told me how to make it several times before she died, but it never tastes as good as when she made it. Yours looks divine. 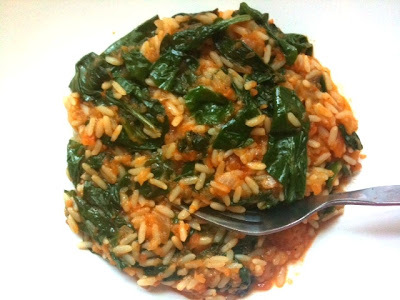 Rice and spinach with tons of mouthwatering flavors! This is one kick-off dish. Really great recipe. I cooked this today and it was delicious.